When you have lost a few teeth or a full arch of teeth, it may seem like there is no hope to having a beautiful, complete smile again. But we are here to tell you that dentures are a viable solution to your problem. They offer durability, a restored smile, and renewed confidence in your ability to eat and speak clearly. There are two types of dentures that are common: full and partial. Each one benefits a different type of patient, and we’ll go through them here. 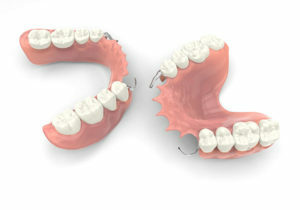 A partial denture consists of the framework and artificial teeth, but does not contain a full arch of teeth. Instead, the artificial teeth are placed in such a way that they fill in the gaps of your smile when you place the denture in your mouth. These can be made from an acrylic or metal framework. Full dentures are best for patients who have lost a full arch of teeth and wish to restore their smile. They also possess an acrylic framework, with artificial porcelain teeth. Full dentures allow the flexibility to stylize a dental device that both restores and complements your smile. They are typically secured to your mouth using a adhesive paste around your gums. Patients will be able to comfortably chew most solid foods again. Casual conversation will come easy, and you’ll feel a renewed confidence again. Why Restore Your Smile with Dentures? Living without a complete smile can bring about unwanted consequences. These are traits such as an inability to speak properly, a poor diet as a result of fewer teeth, and a reduced confidence overall. Dentures may be a quick and easy solution to fill in the gaps in your smile without needing to compromise on comfort or appearance. 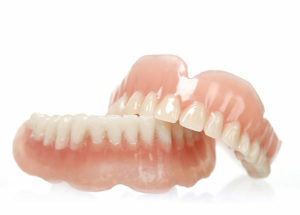 In addition, dentures are surprisingly easy to clean and maintain. They must be removed before you go to sleep each night, cleaned with a toothbrush and toothpaste, and often placed in a cleaning solution overnight. Are you tired of your multiple missing teeth, and are searching for a solution? Here at Christie Park Dental, we can’t recommend dentures enough. Schedule a consultation with Dr. Hughes and our team if you have been feeling unconfident in your appearance due to your incomplete smile. We’ll get you set up on the track towards a rejuvenated smile once again.